Space constraint and need for organized storage of kitchen stock (and other stackable kitchenware) dictates your kitchen pantry design. As with every other aspect of your kitchen, the pantry too should be functional and easy to access. Whether you store food items or stack the everyday kitchen tools like containers, bottles, napkins, towels etc., you need to plan the space efficiently. Kitchen pantry cabinet with shelves and door racks. Photo courtesy of Photobucket. A kitchen pantry design should be extensive – think of all the possible things that you want to stack in it. That is because once you will create shelves or racks, it will be difficult to accommodate any unplanned stuff like some appliance that you may use sparingly. Most of the times we like to keep new kitchen purchases or unused tools immediately in the pantry. You need to plan for that extra storage corner which can be used for such exigencies. Once you know your stuff, you can begin planning the storage sections. You can stack light weight racks on available wall space for small items like spices etc. A small movable rack can be safely stacked in any of the available corners for fruits and vegetables etc. Hanging racks can be used on backside of kitchen doors to stack light weight food items like soup packets, tea bag pouch etc. How much space you can inch out depends on you. Just ensure it does not increase clutter. 1. Select a layout: Keep it single closet, L shaped or U shaped depending on your space and its proximity to your cooking area. A single closet is suitable for mid-sized space and could be placed almost parallel to your cooking area. L shape is suited to mid-sized and large-sized kitchens. U shaped is good for large spaces and large families. 2. Access space: With a L shape or U shape, do remember to keep ample walking space between the L or U parallel legs. 3. Shelving: Space between each shelf can be used for a variety of stock. For example, the lower most shelf should be around 15-20 inches long to allow heavy appliances, recently purchased stock, big cans etc. to be stored. Measure from bottom and keep marking the shelves as you go up. The next two shelves should again have a spacing of at least 12 inches to allow storage of big containers, bottles, canned tins etc. At about your hands reach, keep shelves of about 8.5-10 inches for storage of everyday items like spices, cereals, sauces which are generally stored in smaller bottles or cans. The higher shelves should stack items that are taken out sparingly. You can also keep kitchenware like pans, casseroles etc. here. 4. Extra space: Always keep a small section for unplanned storage needs like a newly purchased utensil, huge sack of grains or a new appliance like a juicer etc. This can be either on the top-most shelf or the bottom-most. Depending upon your requirements, you can chart out shelves in a variety of ways, for example can have vertical shelves for large trays, a rectangular section for storing wine bottles, diagonal racks for cereal boxes, a small section for stacking cookery books etc. 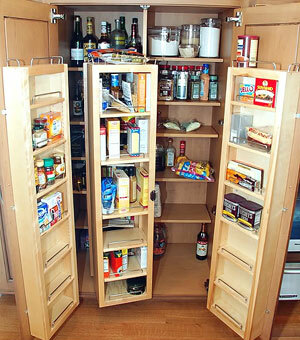 Once you are clear with the layout, you need to choose the pantry organizers. They come in a wide range of sliding baskets, racks, drawers, trays, vegetable bins or basket, wrap organizers, stacking bins, wall hooks for aprons or napkins etc. Except drawers or sliding baskets, other organizers can be freely kept anywhere on the shelves and can be re-arranged as per requirements. So, keep flexible organizers like baskets that you can swap as and when needed. Last on the kitchen pantry design list is storage pattern. You may like to store alphabetically row over row, label it over the racks, have a separate kids’ food section, store category wise, by size, by weight or just by some creative style that you may desire. Ultimately, it should be fast to search, comfortable to access, orderly arranged and above all a pleasant section of your kitchen. What are your thoughts on kitchen pantry design? Do you have a suggestion or comment about designing a kitchen pantry? Please share your thoughts with us by filling in the comment form at the bottom of the page. Also, be sure to check out this kitchen design software. It will help you visualize your project quickly in realistic 3D. What I like most about kitchen ideas is the enhanced sorting and management of your things, especially in the pantry. Managing it well, with a little space consumed is just the thing I need.